9. Major reduction in, heat generation. 1. 1156/ 1157, 32/ 36LEDs. 2. Base: BA15s / BA15d. 3. Working voltage: 6, 12 and 24V DC. 4. Colors available: white, red, yellow, blue and green. 5. 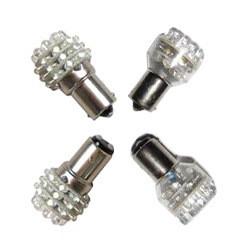 LED cluster: 1 dia ( 26mm). 6. Overall height: 1 - 3/ 4 inch.